To Sum It Up: Aang, Katara, and Sokka are reunited with Toph, who heads up her own successful metalbending school. The friends are all set to celebrate a festival founded by Avatar Yangchen, the last airbender before Aang to bear the title of Avatar. Instead of finding the peaceful meadow where the festival was traditionally held, however, Aang and his companions discover an industrial town now standing in its place. Aang also begins seeing the spirit of Yangchen, and she seems to be trying to convey a warning about this place to him. Meanwhile, Toph’s past unexpectedly catches up with her, and the time may finally have arrived for her to face it. 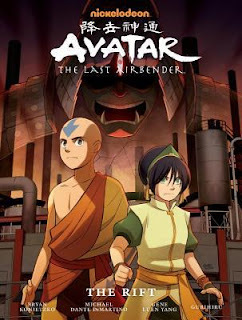 Review: Talk about timing—according to Goodreads, I finished reading The Promise, the first Avatar: The Last Airbender graphic novel, on the exact same day in 2015 that I finished reading The Rift in 2016. This was completely unplanned, but I think it’s really interesting how that worked out, like maybe the dates were destined to coincide? Or maybe I’m just overanalyzing this like I do everything else in life. The Rift is my third Avatar graphic novel read, and I have to say, it had a tough standard to measure up to: the stellar second graphic novel, The Search. The latter resolved what was arguably the AtLA TV show’s biggest cliffhanger AND featured lots and lots of my dear Zuko. He sits this one out while Toph, who last appeared in The Promise, returns. I was a mite wary of the total lack of Zuko in this one, but that quickly proved not to be a hindrance to loving The Rift (although I still missed Zuko, just on principle). Yet again, writer Gene Luen Yang and artists Gurihiru team up to tell a deep, visually stunning story. The fluid continuity between the show and these graphic novels continues to impress me. It’s like the gAang never left TV at all. The characters look a little more grown up here, and we also see the world of The Legend of Korra start to fall into place, especially when Aang, Katara, Sokka, and Toph come across an industrial town. When I first started watching Korra, I had a bit of difficulty reconciling the world of AtLA with the more modern Republic City of Korra, and it looks like we may get to see that development filled in with the graphic novels. You can always count on AtLA for thought-provoking story lines, and The Rift focuses on Aang’s attempt to revive the past and Toph’s attempt to continue leaving hers behind. The two plotlines tie into each other seamlessly, as both Aang and Toph learn to find a place for the past in the present. Like its predecessors, The Rift achieves the perfect balance in tone; I loved the depth of the main story and the impeccably timed comedic moments, usually courtesy of Sokka. I was also happy to see Toph’s lily livers, er, metalbending students, from The Promise again. With each graphic novel, The Rift included, AtLA continues to demonstrate just how successful its jump from one format to another has been. I savored every page of The Rift and every second I got to spend with the gAang again. All in All: Despite Zuko’s absence, The Rift totally rocked, and I really liked the bridge building between where the end of the Avatar: The Last Airbender TV series left off and where The Legend of Korra picked up. I'm so happy that these graphic novels exist because I was so not ready to say goodbye to these characters when I finished watching the show! I hope they continue for a long, long time, lol! So was this part of the cartoon series or are these novels a continuation of Aang's arc? They're a continuation of Aang's arc, and they're every bit as amazing as an episode of the show!